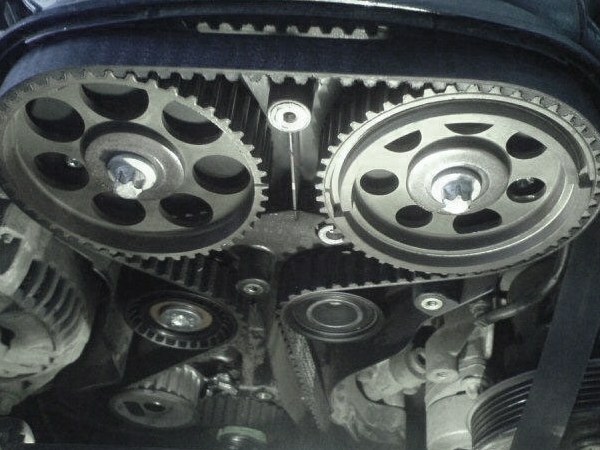 How to change the timing belt for Chevrolet Lacetti"
How to replace the timing belt on a Renault Megan"
The timing belt is the drive, which could break without warning. For this reason, it is necessary to constantly monitor his condition. But we should not lose sight of the pump clips. The timing belt used in most cars. Today is rare to find engine which uses a chain drive. The advantage of the belt is that it does not require lubrication, it is easier to replace, service life is the same as the chain, if not more. But most importantly – automotive engine timing belt is much quieter than chain counterpart. Motorists trying to monitor the condition of the timing belt, as it affects the integrity of the engine. Incidentally, most of the engines of modern cars is not in the piston recesses for the valves. It only means that if the belt breaks the valves will go into the down position. The pistons inertia, commit a severe blow to the valves. And over the belt breaks the repair of the cylinder head, and sometimes replacement. How often to change timing belt? Most manufacturers recommend changing the belt is not less than 60 thousand kilometers. This is a normal mileage for a quality belt. Low-quality instances can break a thousand kilometers. If you are not confident in the reliability of the belt or nodes of the timing, then check the condition of the strap every 10-15 thousand kilometers. For Skoda Octavia, for example, a manufacturer recently recommended replacement of the belt performed every 90 thousand miles. Today this figure has dropped to 60. The lazy drivers who love the risk, continue to change the belt when you run a hundred. But this is not quite reasonable, it's not just decreased the numbers in the recommendations. It was affected by long-term studies of car engines. In other words, a lot of the straps was torn before he was 90 thousand. If we talk about the domestic auto industry, Lada Priora, one of the latest models of AVTOVAZ, needs to be replaced belt after 200 thousand kilometers! The figure is huge, some even unattainable. And the reason for that is a wider belt, it is twice wider than the tens or nines. At last, by the way, the strap is better to change when you run 45-60 thousand. But if you do very little driving, for his peace of mind change it again in two years. Still rubber dries out, cracks, the structure of it collapses. Not only the belt will have to be replaced. Tensioner pulley also needs replacing, but if the engine is a 16-ticklepenny, and support. The rollers are made entirely of metal or plastic with metal. They all have pros and cons, someone will argue that metal is eternal, it is difficult to break. Difficult, but quite real. And just imagine what would happen if this roller will jam. Most importantly – immediately belt breaks. It is therefore better to use metal rollers with plastic insert. If he fails, at least he is not stuck. Try to change along with the belt the water pump. His life is little more than a resource of a roller and a belt. However, it is possible to change the pump with every second timing kit. But if I noticed that the belt edge starts to eat, then blame the bearing pump, of which came the backlash. But most importantly - watch out for belt tension. Depends on its service life. If the tension is insufficient or excessive, it will wear away the teeth, the load on the belt will increase.